The Knife Edge Trail on Mt. Katahdin is shown in this January 2014 file photo. A midcoast Maine man and his son were rescued Sunday on the mountain by a Baxter State Park ranger and an experienced volunteer after they became disoriented in whiteout conditions caused by blowing snow. 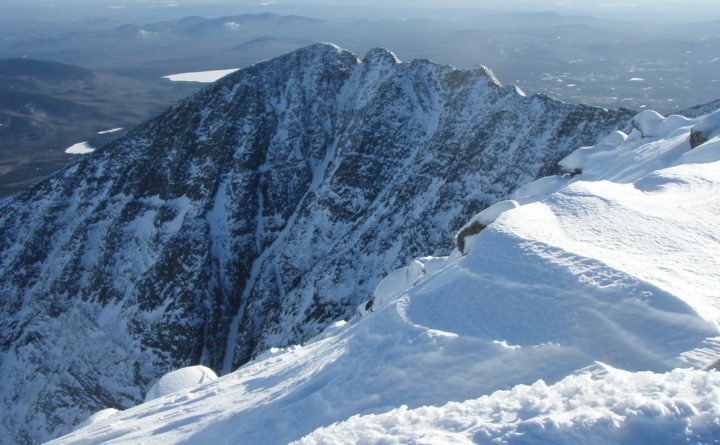 BAXTER STATE PARK, Maine — A man from midcoast Maine and his son were rescued from Mount Katahdin on Sunday after blowing snow caused whiteout conditions along the Knife Edge Trail, according to park officials. The duo became disoriented in poor visibility and wandered off the Knife Edge Trail once near South Peak and regained it closer to Pamola Peak, park officials said Monday in a prepared statement. After several falls due to difficult conditions and unsuitable gear, the pair suffered several minor injuries and minor cases of frostbite. Rangers were alerted to the disoriented hikers after seeing headlamps on the Dudley Trail, which connects to Chimney Pond from Pamola Peak and is closed in summer. The hikers managed to descend on their own down most of Dudley Trail before being met by Ranger Michael Winslow and an experienced volunteer near Chimney Pond Trail. The party arrived to safety at the Chimney Pond Ranger Station at around midnight. The man and his son stayed Sunday night at the Chimney Pond Ranger Station to recover from their injuries. Because winter conditions can change rapidly on Katahdin and elsewhere in the park, officials said, visitors are urged to be prepared, to hike on good weather days, and make sure they review the park’s website in advance for basics on winter park conditions and usage. Mistakes and the resulting consequences often are magnified in winter, they said, and rescue could end up being hours away. “It is your responsibility to minimize hazards by using good judgment,” Baxter State Park Director Eben Sypitkowski said in the release.